How well I’m doing my job is based on one metric above all else: time. To stay “current” I have to keep the workflow within two weeks of today’s date. Everything else should fall into place from there. If I get the work processed in a timely manner, the cycle continues, and money comes through the door. If I don’t, it’s not the end of the world, but it could mean a dry spell down the line. I’ve been treating this blog like I’ve been treating my work this month. These trade posts have necked the hell out of this bottle and I’m working as fast as my social life and other projects/businesses will allow. But progress is being made, slowly but surely. By my count, I’ll have 13 more trade/group break packages left to discuss after this one. Some of them are real doozies. I’m almost into July. 3 months behind wouldn’t cut it in my real world gig, and I don’t want to pretend like it’s cutting it here either. I’ll probably extend catch up month into October so that I don’t keep people waiting. I also feel like I shouldn’t be trading anymore for the time being until I can manage this stuff a little better. Don’t worry, after this is done, my plan is to post a big ol’ pile of trade bait to start the cycle all over again. But that comes later. For now, it’s back to the showing off. I envy Nachos Grande. He’s able to keep up with his trades with relative ease and usually same day. His posting schedule is something to admire and I doubt I’ll find the time to emulate such a prolific rate. While he’s not posting stacks to trade or packages or reviews or Barry Larkin cards, he’s holding group breaks. I was lucky enough to grab a couple slots right when it opened. I nabbed the Cubs and Braves, two of the quickest-claimed teams in any break. 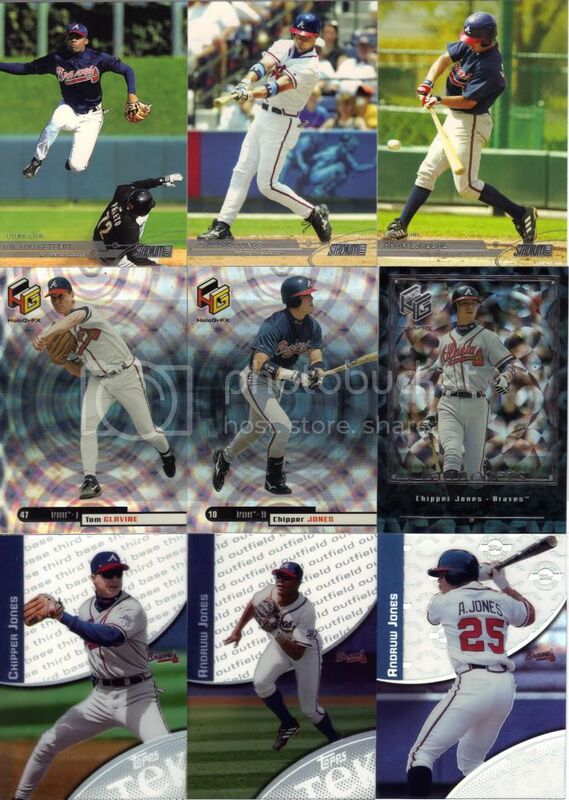 In the break we had 1993 Upper Deck Jumbos, 1999 Fleer Mystique, 2003 Stadium Club, 1999 UD HoloGrFx, and 2000 Topps Tek. A hearty combination. How’d I do? As expected, the break on the Cubs side was Sosa heavy. 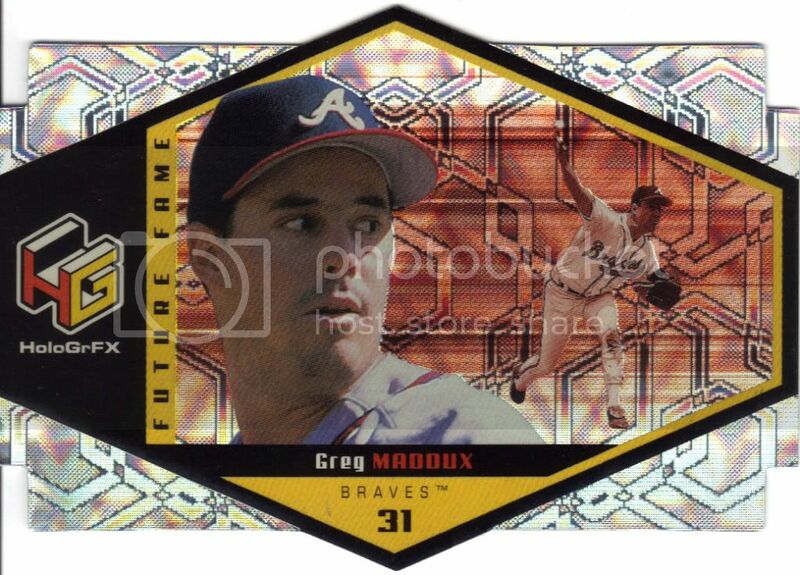 I got the thick gold parallel from stadium club along with inserts from that and hologrfx. 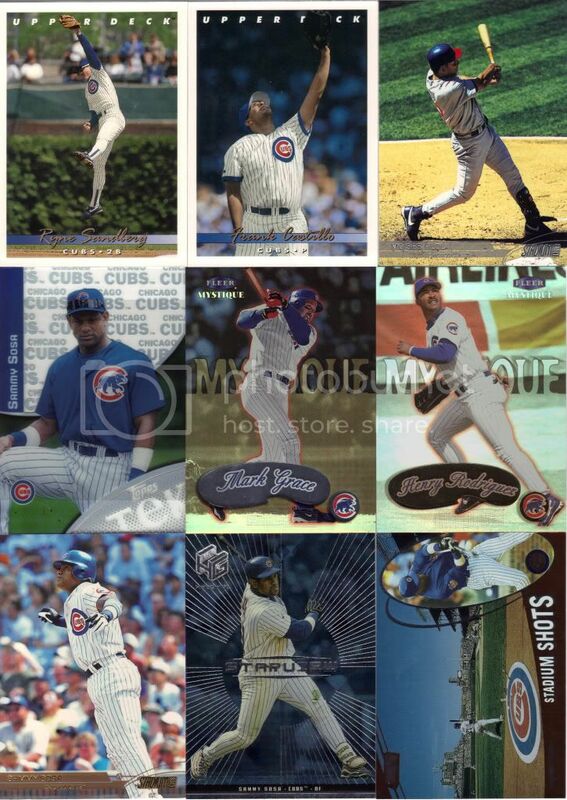 I got a gold Henry Rodriguez, which I’m sure people will clamor for, then there’s a couple cool ’93 UD pictures. Gloves raised for very different reasons. I have two of the Chipper Launchers insert you see middle right, and I don’t need either of them. Some people did really well in the Tek breaks. I did meh. 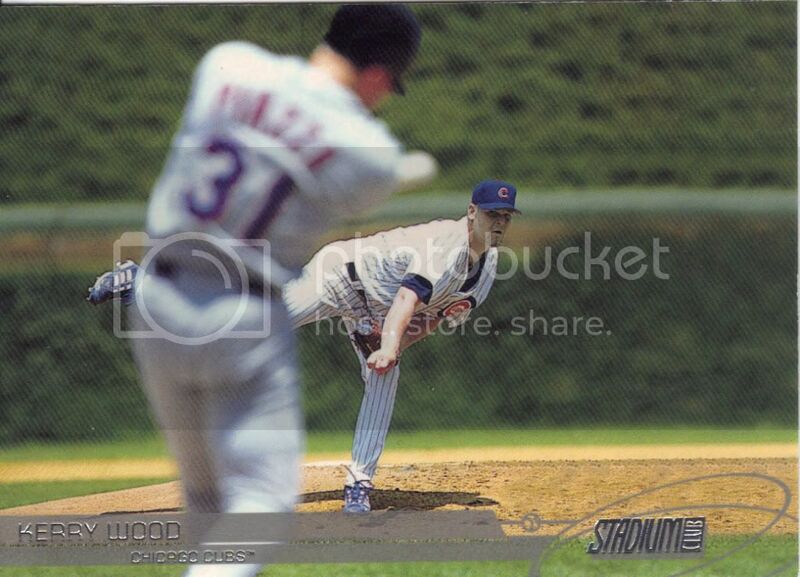 No Kerry Wood as I was hoping for with the Cubs, but I did get a sprinkling of Braves. Nothing incredibly special on this end, just a couple Homerun Heroes (Pendleton tied Justice for the team lead) and the other Mike Stanton. Cool stuff that I don’t need. I was after my player collections only. I didn’t exactly hit the jackpot, but I also didn’t walk away unhappy by any means. Two will enter. One will leave. Ooo, there’s some battlin’ going on over here. This card is cool not just because of the horizontal orientation or the depth of field or the bonus superstar Piazza in the blurry foreground, but also because it gives a sense of the split second nature of the game. It looks like Woody just threw that ball, but you can’t see it. In fact, in nearly that same instant, Mikey finished 2/3rds of his swing and anything could have happened. Both men are following through on their motions at the exact same time. It happens just that fast. Conform. Do as the glove tells you. Collect Topps Tek. This is my first Tek card. I compile my want lists through Beckett’s online checklists, and until very recently, they didn’t have separate listings for each pattern. 2000 is somewhat manageable considering there are only 19 more patterns to go! Oh, and if you don’t know what Tek is all about, see where it says “MLB Players Choice” in the background? The different patterns have different things in that area. Sometimes it’s patterns, sometimes words, sometimes stats, sometimes logos, sometimes just shoot me, sometimes what the hell have I gotten myself into. That kind of thing. In person, the card is more laser-y. 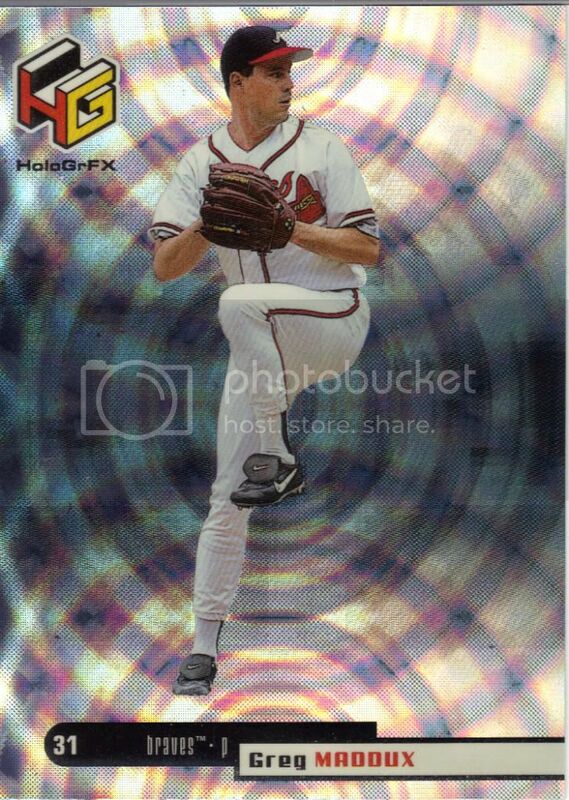 It gives the illusion that Maddux is pitching in a 1980s Doctor Who title sequence, or a disco wormhole. The back is much more subtle. I missed it the first time, but there’s a muted nearly silhouetted portrait of Greg next to the stats. I initially thought it was black space. I have an extra of these from the break if anyone needs it. Shouldn't it be Future Frame? I do not have an extra of this. I keep almost all my cards in a binder. The exceptions are relics, autos, thick manupatches and cards numbered under 100. Because of this card, I added a new stipulation: the condition sensitive. I don’t trust keeping this in pages. It deserves better. I wonder what I would do to protect the gold version. A big thanks to Nachos Grande for holding the break. Hopefully I can squeeze into another one sometime. 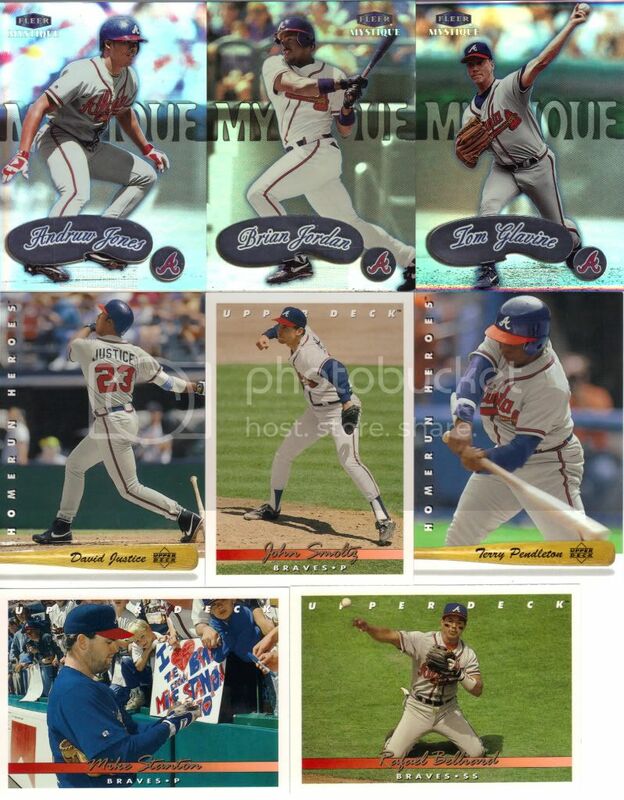 All the non-player collection cards are for trade to Braves and Cubs collectors that may have more use for them. Feel free to stake you claim now, but I may not actually work on the trade for a little while. After all, I gotta get current. Ha! 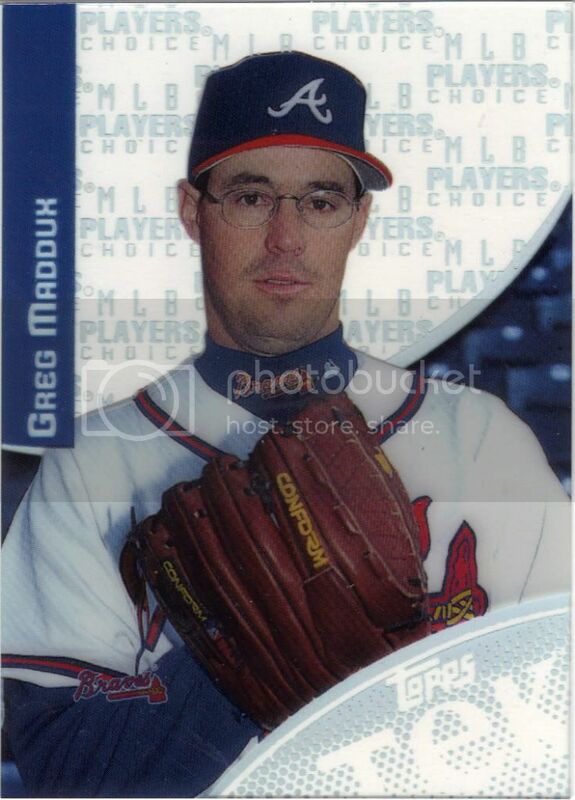 On that Topps Tek card, Maddux looks like an accountant at one of those fantasy camps. Of course, most accountants can’t throw the ball with pinpoint control. He’s calculating how many variations of the card someone can collect before going insane!